The Bible says in Psalm 30:5 that service to God brings unlimited favor to life. Within the pages of Service. 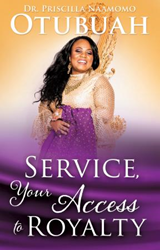 Your Access to Royalty ($14.49, paperback, 9781545638293; $6.99, e-book, 9781545638309), readers will discover that all Christians are called to serve God and gain His favor along the way. God gives the men and women who serve Him faithfully in all circumstances access to royalty. Priscilla Otubuah is a Bible study teacher, member of her church choir, part of her church's protocol/media ministry, overseer of the church's health ministry, writer and editor of the church monthly newsletter, and president of the women’s ministry. Xulon Press, a division of Salem Media Group, is the world’s largest Christian self-publisher, with more than 12,000 titles published to date. Retailers may order Service. Your Access to Royalty through Ingram Book Company and/or Spring Arbor Book Distributors. The book is available online through xulonpress.com/bookstore, amazon.com, and barnesandnoble.com.